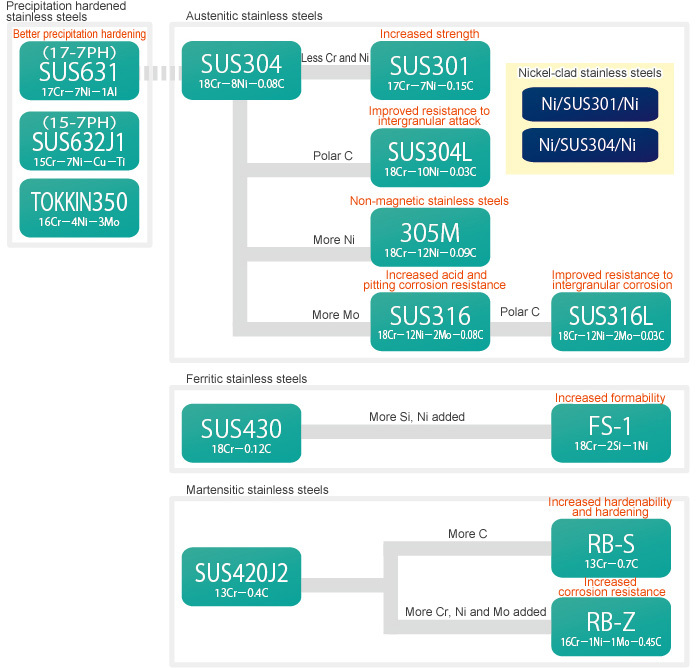 This comparison diagram explains the relationships between austenitic steels (such as SUS304), ferritic steels (such as SUS430), martensitic steels (such as SUS420J2), and precipitation hardening steels (such as SUS631). To see general properties for stainless steels, refer to the Material Properties Guide below. SUS301 has a chromium–nickel ratio of 17–7, which is slightly lower than that of 18–8 stainless steel. Since the material's austenitic structure is not stable, the cold rolling process will cause martensitic transformation to occur. SUS301 demonstrates the largest increase in magnetism due to work hardening of any austenitic stainless steel. Often referred to as "18–8 stainless," SUS304 is a popular steel grade, and is the most commonly used austenitic stainless steel. SUS304L has a lower carbon content than SUS304 and provides excellent resistance to intergranular corrosion. It has low hardness and low work hardenability when annealed, making it suitable for deep drawing. Austenitic stainless steels are typically non-magnetic when solution heat treated and magnetic when cold rolled. 305M is a non-magnetic stainless steel in which these tendencies have been reduced. SUS316 has higher Ni content and contains Mo, for good corrosion resistance. It is often used for drawing applications, but due to its low carbon and high Ni content, it exhibits low hardness and work hardenability when annealed. SUS316L has a lower carbon content and better drawability than SUS316. Maintaining the superior properties of 18–8 stainless, SUS631 is the most common precipitation hardening stainless steel capable of being strengthened through heat treatment. Although SUS631 becomes soft and can be processed in a variety of ways when solution heat treated, it requires an intermediate heat treatment to harden. Even when solution heat treated, SUS632J1 is hard at normal temperature, and the only heat treatment subsequently required is a single precipitation hardening operation, which makes it simple to process. As SUS430 has a higher chromium content than 13Cr stainless steels, it provides better corrosion resistance. At the same time, it is easy to process because it does not undergo transformation when worked like other austenitic steels, and is the most widely used stainless steel grade. FS-1 is harder than SUS430 by far and has good formability. As it is not prone to press cracks, it can also be pressed quickly and accurately. SUS420J2 is quench hardened and then tempered to varying degrees to obtain an impressively wide range of mechanical properties. When shipped, the structure of Tokkin SUS420J2 contains completely spheroidized carbides, making it one of our more easily processed annealed-finish materials. RB-S has an even higher carbon content than SUS420J2, giving it good quench hardening properties. It provides one of the highest levels of hardness of any stainless steel, and is used for blades and other applications. RB-Z features a higher carbon content than SUS420J2, and better quench hardening properties. Moreover, it has a higher chromium content, and also contains nickel and molybdenum for significantly improved corrosion resistance. Austenitic stainless steels with an annealed finish offer markedly lower yield strength relative to tensile strength, and have a high degree of elongation. Austenitic stainless steels are excellent materials that are capable of withstanding a variety of complex processes. However, as they are tough and have an extremely high degree of work hardening and spring back, special considerations are required with regard to processing machinery, dies, lubrication, operating methods, and other factors. Except for the soft materials described above, austenitic steels with a rolled finish have stronger directional properties as their strength increases. It is therefore important to select the correct orientation when processing, particularly when bending. Precipitation hardening stainless steels can be strengthened by heat treatment. One such steel, SUS631, is a soft metastable austenite phase when annealed (solution heat treated), which allows it to withstand complex processes just like austenitic stainless steels. By performing the precipitation hardening (heat treatment) process after processing, it is possible to obtain good workability and strength. The mechanical properties and workability of ferritic stainless steels are approximately equivalent to those of medium carbon steels. As products with an annealed finish are susceptible to the stretcher-strain marks seen in soft steels, it is necessary to use products with a skin-passed finish to avoid such problems. Martensitic stainless steels with a low carbon content are easier to work than ferritic stainless steels. Martensitic products with a higher carbon content are hard even if given an annealed finish, making complex processing difficult. Bright annealed after cold rolling. Materials with a BA finish are the softest, and are suited to sophisticated and complex processing. Materials with a skin-passed finish are lightly rolled after annealing to create a suitable sheen and smoothness. Rolling increases hardness a little, but workability is about the same as for the BA finish. Useful in preventing the stretcher-strain marks that annealed ferritic stainless steels in particular are susceptible to. Uses more rolling force than a skin-passed finish to produce a deep sheen and smoothness. Can provide extensive strength depending on the degree of rolling. However, higher rolling reductions result in stronger directional properties and shorter elongation, making complex processing difficult. For SUS301/304/631 and other materials, degree of rolling reduction is stipulated as 1/4H, 1/2H, 3/4H, H, etc. The material is cold rolled using a roll with a sheen to create a glossy surface finish. The material is cold rolled using a roll with a rough surface to give a matte finish. In most cases, material is polished with equivalent of 400-grit sandpaper. Material can be polished on one side or both sides. Workability is almost the same as for the BA finish. Uses a finer polishing material than that used for No. 4 polish. Produces a finish with continuous buff marks. Grade of polishing material used is determined by application and desired results. Produces a finish with continuous buff marks. 1. To soften a material that was hardened through cold working or another process. 3. Solidification of precipitate, necessary components, etc. Standard annealing conditions are indicated below.